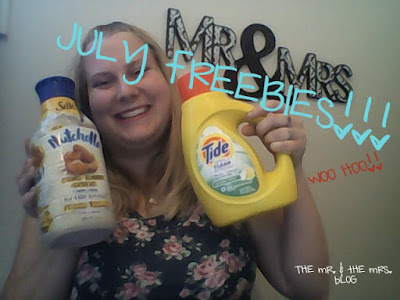 Mr & Mrs Blog: July Freebies!! It's here, It's finally here! The Mr. & The Mrs. blog monthly freebies video!! Thanks for watching & I sure hope you enjoy. Make sure to SUBSCRIBE!! More videos are coming! Also you can find ALL the links below!! Plus a BONUS one. Schoola: Get $30 free in clothing! Follow my link & sign up and then create a collection and earn $30 for free clothes! Happy shopping! Topcashback: Shop through TopCashBack and earn free items and money back on every online purchase! Crowdtap: Earn giftcards for Amazon and also get FREE products! Amazon Review Trader: Apply to review items for Amazon! Kroger Friday Freebie: Every Friday get a FREE product!! Find a store near you and sign up below! Kleenex: Send a free package of Kleenex to a friend or family member with a sweet message of care!